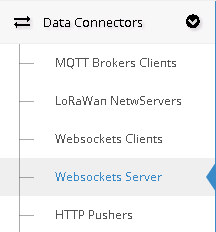 Websocket Server is placed under the Data Connector menu. Every device communication is sent via a JSON formatted string. Of course, depending on the type of the communication received, some of the fields can be empty or nil. Here's an example of a gateway alive communication. Here's an example of a join request. Or a simple Rx communication. And a downlink tx. Also note this is not how to send a tx via the socket, this is how a downlink sent via the platform will appear on your communication log. "Reference": string,    --A reference used by the server when confirming(comm_tx) the reception of your communication by the node. "Payload": "HI! ",       --or "Raw": false, and "Payload": "484921"
Please notice a "Success" result does not necessarely mean the communication has been received by the network server. It only means your downlink request was correct and that an attempt to contact the server has been made successfully. - Visit the site www.websocket.org and paste the URL into the Location field then click on Connect. - You are now connected to the WebSocket! You can send messages or just read what pass through there. Websocket Server Page contains some examples of JSON files that describes how communication between devices and Websocket works.